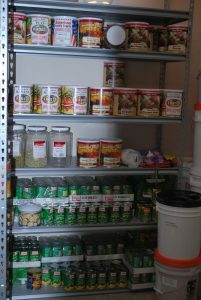 When I found myself single in 2010 I was very grateful for the food storage I had been building. I had 5 children and no income for 9 months. If it wasn't for my food storage we would have gone hungry, not had laundry detergent and many other necessities that we needed. I didn't start out my adult life with a food storage but I did learn from watching my parents that it was important. We had always had a food storage growing up. There were many times in my youth where it was our main source of food. So, when I got out on my own I knew it was necessary to start one. One day I was asked to teach a class about food storage at my church. I knew nothing about starting one or how to have one in a small apartment. There was also no internet at the time to go searching on to help me. I asked and learned from watching a very dear friend of mine who had nailed it. Her food storage was the envy of anyone who saw it and still is. Lastly, another dear friend was an endless resource of knowledge. Kati Kiefer, founder of True Couponing. In 2009 Kati's husband, James, received a large pay cut and they quickly found themselves in a difficult financial situation. Because of this Kati, with her degree in accounting, quickly figured out creative ways to reduce their monthly grocery bill from $600 to $200. Since then she has helped thousands of people do the same thing. With these amazing women as examples in my life and a bit of research as well, I've gained a wealth of knowledge. I'll share with you some of the best ideas for how to get started and how to do it on a budget. To make it more simple and easier to follow, I'll break it into 3 different posts. I know. I know. This is pretty obvious, right? Well, did you think to yourself when you saw the title of the post, saw a picture recently, or even while reading this post that you should start one? Did you do anything about it? Did you make a real decision? Did you tell your significant other or have a discussion about it with your family? Or did you just think, "humm... I should probably start a food storage." Then the thought was quickly pushed to the back of your mind? If you're like most people, that's actually what happened. These are just a few of the steps that I'm going to take now that I have decided. What about you? 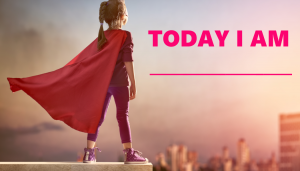 What are you going to do to get started? HINT: It doesn't have to look pretty! You don't need a bunch of fancy shelving and containers. My first good storage was stored under my bed, in closets, and we even used it to make tables by stacking. This is the part that so many of us get hung up on. I don't know about you, but thinking of needing a food storage gives me anxiety! 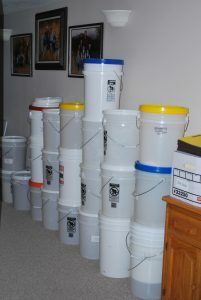 I immediately think of a wall of 5-gallon buckets with whole wheat in them or spending thousands of dollars on shelving and containers. Then I imagine coming in from the cold to try to find something to feed my crying babies and not knowing at all what to do with what I had. Am I alone? Start with storing water and a water filtering plan. This is a must and shouldn't be put off. Put this one at the top of your list. I'll even challenge you to do this one thing before the end of the week. One thing I learned very early from my friend 26 years ago was that I needed to store what my family would eat. First, go to a site like Provident Living and enter your families information. This will show what is recommended to have and in what amounts. THEN be sure to consider this list as a starting place to create your own real list depending on your own families tastes. She explained to me that if we never ate whole wheat it would be a bad idea to have it in storage. My recommendation is to start with a 1-month supply and begin rotating this through your regular meals. This is a great first goal to set. You'll be surprised how quickly you'll get this done. Next work on a 3-month supply, then 6-month, then 9-month, then 12. Before you know it you will have created a great system for storing and using your storage. Then if/when something unexpected happens you will be secure in knowing you have a store of food that your family will use. We need to be sure to store more than just food. What about medicine? Do you have pets? We all use soap and other cleaning products so we need to be sure to store these as well. Over the next 10 days or so, be sure to track what items you may need to store outside of food items. Other things to consider are a generator for electricity, oil, gas, and things that you may need in case of a major disaster. WARNING: If you are like me you will soon find that you have way too much information and quickly lose steam. This happens when we research a topic and sign up for every free list or download. Then we get bombarded with so much information our heads explode. So, I've saved you the trouble. Here are a few links to sites that I recommend. MOST IMPORTANTLY do not sign up for every one of them or use every one of them as a resource. Chose ONE or TWO that you enjoy or find valuable. Once you have learned what you can from them chose another one or two to learn from next. Sometimes too much information can be overwhelming. I'd love to hear from you! 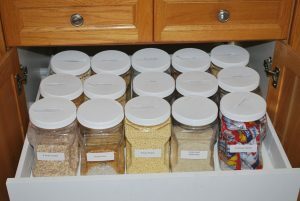 What food storage ideas work for you and your family?